The NetBenefits® smartphone app gives you the ability to access your Fidelity workplace accounts — including retirement, stock, and pension plans, plus the health benefits you’re enrolled in — right on your Windows Phone. The NetBenefits® smartphone app is optimized for Windows Phone 8.1 and above. Library Review financial educational information to better understand your options and make informed choices for your retirement planning. Browse our collection of articles, videos, and podcasts. 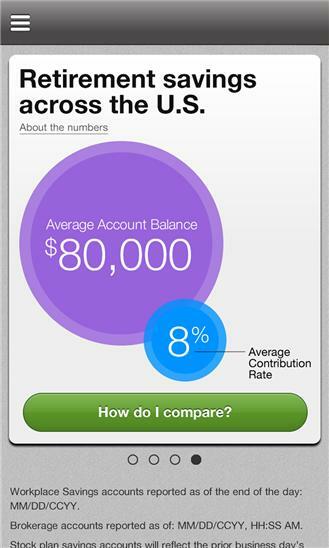 Peer Comparison Compare your retirement plan information with people in your age group and location to understand how your savings goals stack up. Retirement Accounts Keep your financial goals on track by monitoring your retirement plan balances and investments, your plan’s account performance, and more. Stock Plans Monitor your stock plan account information, exercise employee stock options, and accept grants. 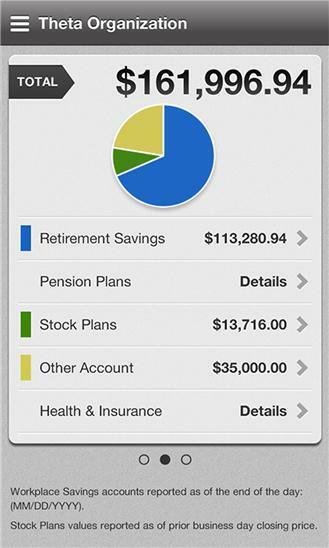 Pension Plans Access important information about your pension plans, including plan balances, if available. Health & Insurance Get a complete view of the medical, dental, and vision health and insurance plans you are enrolled in. Review detailed health benefits information, including in- and out-of-network costs, coverage information, and provider contacts. Other Accounts Review other Fidelity accounts, like 529 college savings plan accounts and brokerage accounts, to see how they contribute to your overall financial strategy. Additional Information The NetBenefits® smartphone app is available to individuals who have one or more employer-sponsored workplace benefits provided by Fidelity Investments. Please note that the app is currently not available for use with Fidelity-serviced HR/Payroll plans. Employer-sponsored account functionality includes transactions for employee stock plans; for all other accounts, functionality is limited to viewing account balances, history, positions, year-to-date performance, and benefits information. NetBenefits is a registered service mark of FMR LLC. The NetBenefits design logo is a service mark of FMR LLC. The images below are for illustrative purposes only Fidelity Brokerage Services LLC, Member NYSE, SIPC © 2014 FMR LLC. All rights reserved. 696322.2.0 Minor improvements and updates.